If you’ve clicked on this post hoping for book recommendations, you have the wrong post. Fortunately for you, I do have a post dedicated just to that, which you can find here. Today’s post is all about the non-book gifts you can pick up for a bookworm. This is the last of my gift guides for 2017 but if you still need a little inspiration, you can find all of my previous guides (including the ones from last year) here. Book merch seems to be having a real moment. It has never felt easier to pick up extra bits in order to show your passions. 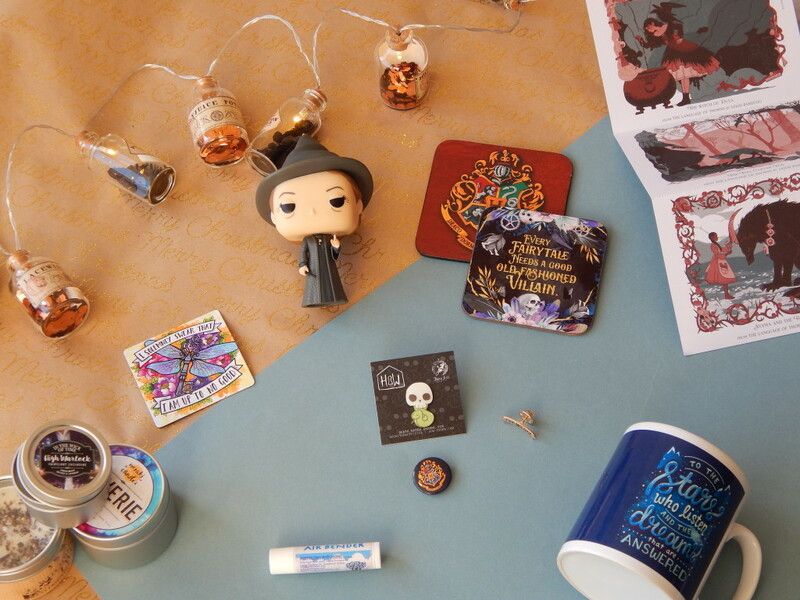 This also means that if you know the books someone loves, you can pick up some lovely gifts for them. This gift guide isn’t so much about the individual gifts but ideas of merchandise that you could pick up for somebody, particularly if you want to keep it small and subtle. First up is PopFunkos. I picked up this Professor McGonagall one in a shop in Newcastle for around a tenner but they are really easy to pick up. You can get them in stores like HMV or Waterstones, or there are plenty to choose from on Amazon. I use mine as a decoration on my bookshelves. If the person you are buying from doesn’t like Harry Potter, don’t worry. I’ve seen everything from Disney to Yuri on Ice. If your friend would prefer something smaller, a badge is a great choice. You can be as explicit or subtle as you want. Literary Emporium does some great badges and I even picked up some in Primark for around £3 recently! Of course, they were Harry Potter related but if you know of someone who is waiting impatiently for their letter they would be perfect. In fact, Primark has some great Harry Potter bits in it at the moment. You can pick from PJs, cushions, hoodies and even the infamous bottle lights (which are just as cute in person) depending on who you are buying for and how much you want to spend. Mugs are a great option. You could pop some hot chocolate sachets in it too , if you wanted an extra special gift. I got this lovely Sarah J Mass mug in a FairyLoot box but there are plenty on Etsy. I would also recommend Fable and Black for a mug or even for a coaster to go with it! Their products are always of a high quality and super affordable. I picked up some coasters and bookmarks from them as a birthday present recently and they were very gratefully received. For something a little different, you could always pick up some beauty bits related to their favourite book. The ultimate place for that has to be GeekyClean. They have loads of things including lip balms, bath bombs and perfume oils. They also get serious bonus points because they are cruelty free. My penultimate recommendation would definitely be for candles. I love candles but I love them even more when I can see the personal touch behind them. Perhaps someone has noticed that I like really fresh or floral scents. Or maybe they’ve even managed to find a candle related to a book I really like. Such a candle would make for an extra special gift in my book. And yes, that pun was intended. Finally, if you’re looking for a more expensive gift to treat someone who loves books, you could look at getting them a book subscription. There are plenty of options available. I’ve been pretty vocal about how much I love FairyLoot and would heartily recommend them. I’ve also heard wonderful things about the Wildest Dreams book box, which is a new service and a little cheaper. Hopefully this post has given you plenty of ideas of book related gifts you could pick up for an avid reader, irregardless of your budget.